when he released a track titled ” Makossa phoenix” in which sound-wise and lyrically he showed his devotion to the authentic Makossa that has been so lacking in recent years on the Cameroonian music scene. Despite all the accolades and plaudits the artist has garnered over the years, it is regrettable that this 30th anniversary celebration will be held abroad, and not in Cameroon the homeland of the Makossa he so proudly and strongly advocates. That said, more grease to his vocal cords as he will need it to explore his rich repertoire come October 6. Polemic: Makossa isn’t dead,it’s simply marking time. With the track “Makossa phoenix” from his last album, Makossa heavyweight Ben Decca confirmed what most people had been saying for a while: the death of Makossa. But wait a minute. 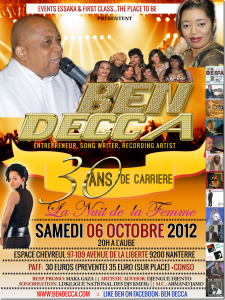 Was Makossa so dead that Ben Decca had to celebrate its resurrection with a track? I beg to differ. Since Makossa stopped getting the same continental recognition it had been enjoying in the 80s through artists like Toto Guillaume and Ekambi Brilliant, some people quickly declared its death, made an autopsy and are burying it. Despite these pessimistic declarations about Makossa, it is good to know that the rhythm isn’t dead, it is simply marking time. People have the feeling that Makossa is dead because of the influx and popularity of foreign genres. But this situation shouldn’t be taken to mean Makossa is dead. Makossa has sure lost its former glamour and status worldwide. But it is alive and could fair better if some Makossa artists started trying to internationalise the sound by fusing it with other rhythms. We now live in a multicultural society where people need to see or hear a part of themselves in another’s enterprise before connecting with it. This is what some Makossa gurus haven’t understood and nostalgically cling to some lost perception of Makossa as their sole preserve which shouldn’t be desecrated. Makossa no longer belongs to the Sawa. It is now national and for it to return to the world stage , it needs to evolve. Contemporary Makossa cannot and should not sound like old school Makossa because each generation has unique musical craving that must be catered to. Lucky enough, some young musicians are trying to make this happen with concepts like Hip-makossa. Let’s just hope that the main men in the industry understand this. If they don’t then the feeling that Makossa has died will continue. Makossa is fortunately just marking time.